We didn’t actually last 24-hours, but we never planned to and actually Mik ended up lasting much longer than I expected. 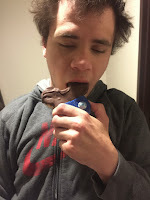 We left the hotel around 4:30am and Mik enjoyed his Diamond Mickey Rice Krispy treat that I had brought back for him a previous day. We were in line for security by 5am. It was much like the Expo, although the park was already opened so it actually was moving pretty smoothly by the time we got there. 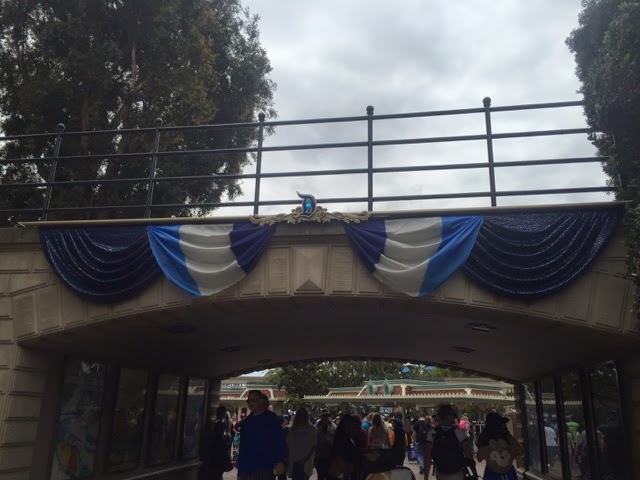 Once through security it was no line to get into Disneyland. 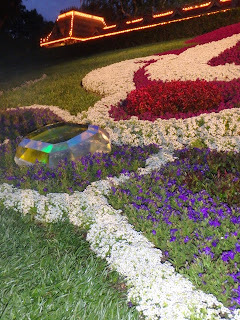 We briefly stopped in the entrance plaza to get a photo of the diamond as the day before too many people were taking pictures when we tried and this time mostly people were rushing to get on to Main Street. Even stopping for some pictures we were on Main Street by 5:30am. 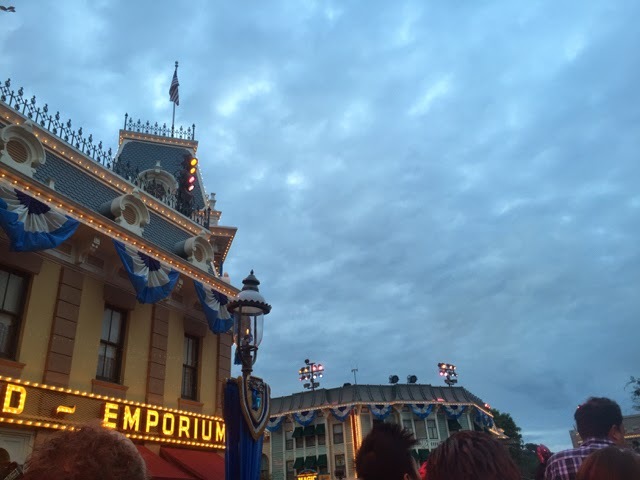 Main Street was a little crazy with it being wall to wall people back to the Emporium. 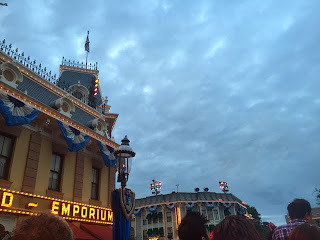 Mostly people were not pushy, though, and the only real issue was that we got mixed in with the Emporium line. Once we figure out how to get out of that and then trying to get enough space to go at the right angle across the tracks it we ended up in a decent spot to wait for the park to open. 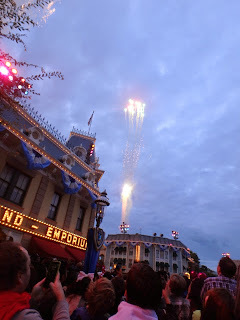 While we were around the corner from being able to see the fireworks go off over the Castle, we still got to enjoy the fireworks go off behind the train station and the shops on Main Street. 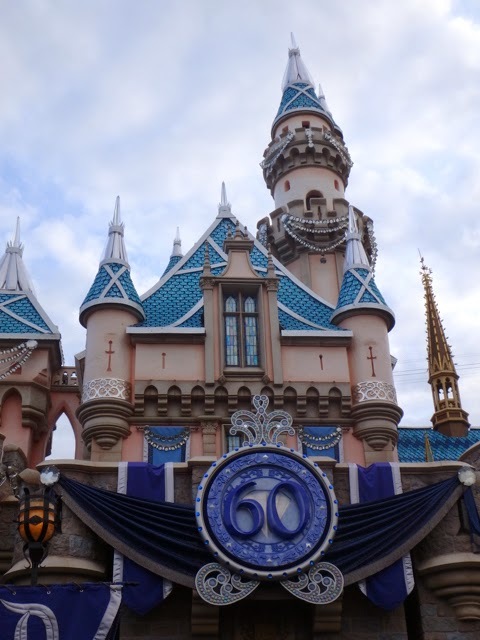 Then it was the normal surge of crowd at park opening other than it was much farther backed up on Main Street. 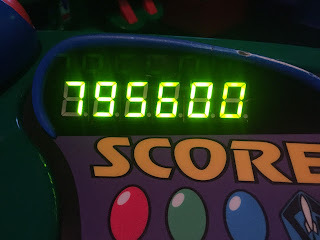 Still we got through and walk on to Buzz Lightyear within 10 minutes. We just missed the wheelchair vehicle when we got to the front, so we actually had to wait to ride, but that’s pretty normal and actually had a nice conversation with the Cast Member since the ride was still empty and they didn’t have to direct people unloading much. As usual we went around twice. 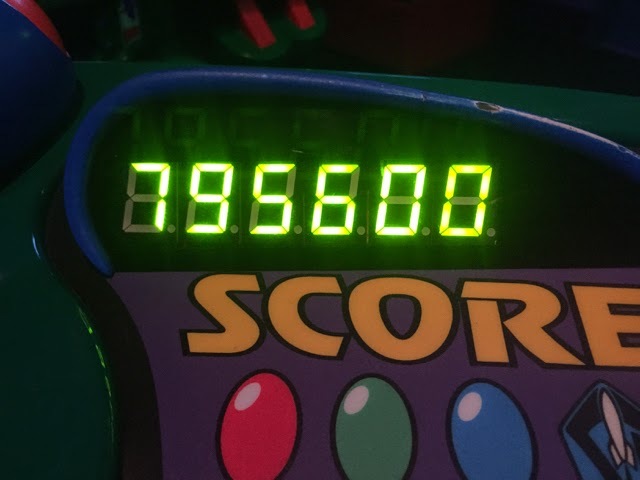 The second time we got stopped in the photo tunnel and I racked up one of my best scores. After Buzz Lightyear, we wandered over to the Castle to get some photos with the 60th logo, which had been unveiled after we left the park the day before. 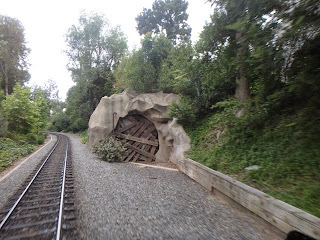 We then walked over to the Toontown Station and rode the Disneyland Railroad around the park once. I thought it was funny when we went by Autopia and Mik asked what that ride was. I guess it’s been awhile since we last took him on it. After the train, it was not even 7:30am and Mik was already asking to go back to the hotel. We stopped for some breakfast in Fantasyland including a 24-hour event souvenir mug and then got a 60th bucket in Frontierland before he decided that we should brave the pin store line before leaving. 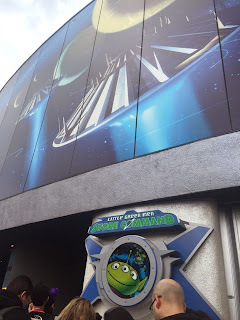 The line for the Little Green Men Store Command ended up reminding us of the D23 Expo. It certainly does seem crazy to stand in line for what ended up being five hours just to spend money. Honestly, I probably wouldn’t do it if Mik wasn’t interested in it. It’s just ends up being good quality time and certainly preferable than ending up back at the hotel after only a few hours in the park, which is what happens most days with Mik. 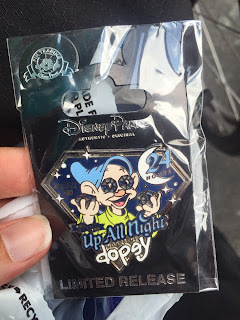 About two hours into the wait they announced that they were out of the Being Up All Night Makes me Dopey pin, which is the pin Mik really wanted. We didn’t want to bail, though, because we had already waited so long and we knew there was still a decent amount of other pins to choose from even though we didn’t know exactly what they were. In the end, though, when we got to the front they had the Dopey pins (restocked at some point?). This gave Mik enough motivation to stay in the parks for lunch before heading back to the hotel. 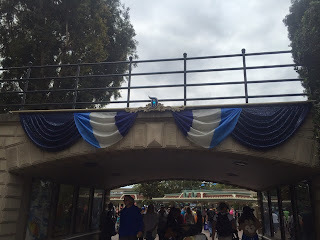 At first we went to the nearby Tomorrowland Terrace, but after 15 minutes of the line going nowhere I bailed that idea and decided to find somewhere else with a line actually moving. We ended up at the healthy snack spot in Tomorrowland, which had no line and was actually a much better option all around for lunch for both of us. Also, picked up some Mickey pretzels at a nearby cart with very short line to carry back to hotel for a snack later. 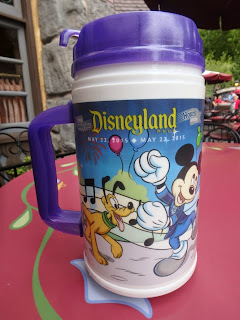 After refueling and resting a little from standing in line for hours, we headed out of the park leaving around 1:45pm. The park was crowded at this point and apparently it closed for capacity not longer after that, but actually it was not as crazy as we thought (Buzz line was still only 20 minutes when we left and we’ve seen worse on spring break and summer trips) and it was the longest park day with Mik in years. Definitely glad we did it even if we did miss out on most of the special event stuff.